This year of agency reviews is a tremendous strain on business, according to WPP's CEO Sir Martin Sorrell, who spoke at a fireside chat at Advertising Week. "When you are the incumbent, you have to run two trains on time. I call it the parallel universe." Moreover, the trend toward selecting agencies based on price is destructive. Sorrell doesn't think it is fair for clients to expect agencies to act as insurance companies or banks. "You can't choose based on payment terms." Nonetheless, Sorrell recognizes that the industry is evolving -- noting that even calling the week-long event Advertising Week by that name is outdated, since many of the panels don't discuss the traditional pillars of advertising. "The notion that traditional creative is king needs to change. The business has changed. Wake up," says Sorrell. Agencies need to adapt to the new model that places just as much importance on data and digital. "Seventy-five percent of our revenue comes from areas that even Don Draper wouldn't recognize," he says. "Even Cannes Lions has broadened the definition [of its awards] to include data and healthcare." WPP has expanded the definition of competitors to include the "layers of software" providers such as Oracle, consultants like Deloitte. Even IBM reportedly operates the largest interactive agency in the U.S. He welcomes these new players though he jokes "I don’t mind competition as long as I have all of the horses." Still, the disruption caused by these new players is an area of concern. Sorrell thinks the fact that Google can provide measurement is ridiculous, noting that no one would ask Disney or Fox to "be the referee as well as player." He believes there is an opportunity for third-party referees in this environment. In fact, earlier this year he urged Rentrak and comScore to get together to devise better measurement for the industry. To what extent he orchestrated their merger — announced yesterday — is unclear. WPP has ownership stakes in both measurement firms. Despite Sorrell's concern over Google's reach in the advertising space, he believes that Google is the essential platform for the industry. "Facebook has a strong brand, but in terms of sales effectiveness, nothing [beats] Google Search." 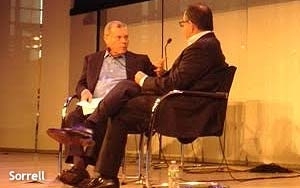 2 comments about "WPP's Sorrell: Traditional Creative Shops No Longer Rule The Roost". Kevin Densmore from Titanium Media Solutions, September 30, 2015 at 6:03 p.m.
Did Sorrell say it's ridiculous for the referee to be partly owned by the seller while his company which owns major buyers also owns parts of Rentrak and comScore? Catherine Hahn from Kovel Fuller replied, October 2, 2015 at 4:16 p.m.
"I don’t mind competition as long as I have all of the horses."